Many addressed Mi Fu as “Crazy Mi” for his love and obsession with stones. He was in reality a multi-talented person, especially in calligraphy and painting. As well as being one of the four great calligraphers of the Song Dynasty (960-1279), his painting skills left a significant impact on subsequent painters with his self-invented technique. Like father, like son, Mi Fu’s elder son Mi Youren followed in his father’s footsteps and was nicknamed “Mi Junior.” Both Mi senior and Mi junior occupied an important place in the history of Chinese painting. Su Shi, another great scholar of the time, was a good friend of Mi Fu’s for many years. Su visited Mi and they exchanged views with genuine sincerity. As a painter, Mi Fu agreed with Su Shi’s view that “a poem should be picturesque and likewise a painting should be poetic.” He too incorporated the freehand brushwork used in calligraphy into paintings. Famous calligrapher-painter Dong Qichang of the Ming Dynasty (1368-1644) considered the Mi style a class of paintings that shunned details, but focused on artistic concepts in a minimal way. 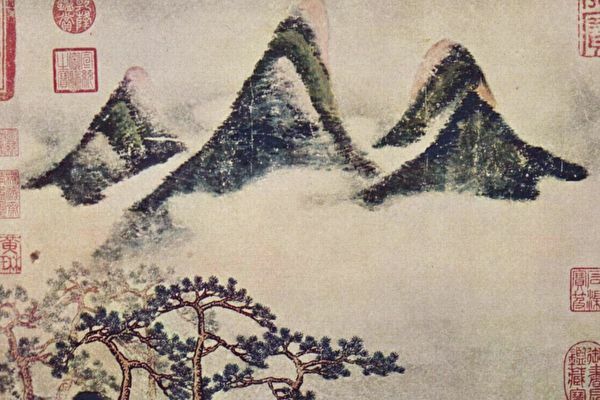 Mi Fu’s Mountains and Pines in Spring is very different from paintings of other landscape painters of the past. This work is an art piece that is condensed like forging iron in the fire, yet remaining light and refined at the same time. The brushwork is brief and simple. The color tone is deep and steady. The contrast between the different shades of green foliage and the heavy white clouds makes the dark mountains look even more solemn and dignified, lifting the spirits. Originating with Mi Fu, this style of freehand brushwork left its imprint on the history of Chinese painting. The style is recognized as the “scholarly freehand style” and is considered an important class in Chinese paintings, which had a significant impact on the development of Chinese art.